Bookworms like to convince the universe that we are very very very smart. It is a lie. A complete lie. And I can confidently say this because I know the inner workings of the bookworm mind SINCE I AM ONE. See there’s this thing called Bookworm Logic™ and it roughly translates to “something that makes no sense to non-bookworms, is bizarre, and probably dangerous, and yet makes PERFECT SENSE TO ALL BOOKWORMS“. And even though we justify our Bookworm Logic until Armageddon and back again * — most of it is still entirely dubious. * This sounds like a Tolkien novel?? Armageddon And Back Again?? OR POSSIBLY THE TITLE OF MY FUTURE MEMOIR. ** Unless you dog-ear pages and then, no sir, and stop. *** Hands, hands? Do I see a show of hands? ….please? Average Logic: Perhaps stop acquiring books until potential of death is averted. Plus you already have such beautiful books on your TBR that you’ve looked forward to reading since time began and fish roamed the earth, so just read them and stop trying to eat 54 cupcakes at once. Bookworm Logic: I’m dying anyway under my monstrous TBR. There is NO HOPE FOR THE FUTURE BUT TO GET MORE BOOKS. Plus I don’t want my TBR to be unfed and undernourished????? I must feed it???? Average Logic: I won’t buy that book this week because I should adult and pay for food/rent/clothes/birthday present for Dear Aunt Algernon whom I love so very much. Bookworm Logic: I could just eat tuna for the week???? And I can send Dear Aunt Algernon a postcard???? And I could live in a cardboard box on the street??? YES THAT’LL BE FINE, NOW I CAN BUY THIS BOOK. Average Logic: I’ll just save reading this book till I’m home because it’d be super awkward to be crying in front of a ton of people with only a paperback to blame. Bookworm Logic: I’LL JUST CRY ALL OVER EVERYONE IF I MUST. Average Logic: That’s fair. Not every book is for everyone. I’ll find a different book to get them to read. Bookworm Logic Part #1: I’ll duct tape them to a chair and prop the book in front of their eyeballs and refuse them food until they read it and I shall periodically pterodactyl screech in their ear until they they fall HOPELESSLY IN LOVE WITH IT LIKE I AM. Bookworm Logic Part #2: Or we sacrifice them at dawn. Average Logic: Both have their uses! Ebooks are great for travel and having access to more books and cheaper to collect! Physical books are beautiful to collect and are a physical representation of words and can be easier to read. Bookworm Logic: PHYSICAL BOOKS SMELL NICER. Average Logic: I’ll google the pronunciation and get opinions from other bookworms and maybe listen to the audiobook sample to see how they say it. Bookworm Logic: Look I’ve been mangling it all this time and there is like 2% chance that I’m ever going to change. IT’S STUCK LIKE THIS NOW. THERE IS NO HOPE FOR THE MORROW, FIENDS. GET USED TO IT. Average Logic: I’ll read some reviews, get some opinions from close friends, try a sample on Amazon. Maybe I’ll borrow it from the library first to see if we mesh first so I don’t waste any money. Bookworm Logic: But it’s pretty and it’ll be beautiful on my bookstagram account so I’ll just buy it and regret my life later. Average Logic: I’ll make sure the humans of this galaxy know what they’re getting into before they try it. That way they won’t (A) be miserable and shocked because they weren’t expecting their feels to be skewered and barbecued like a lamb and coriander kebab, and (B) they won’t try to kill me for destroying their life. Bookworm Logic: I’m going to give it to them and tell them it’s super nice. Then I’ll watch them suffer like I had to. THIS IS GOING TO BE GREAT. Average Logic: I’ll either think about it a bit longer and gather my thoughts or I’ll just madly type up what my feels are and leave it at that. But I better do it now before I forget too many details. Bookworm Logic: Well I have (A) no idea what I think about this, (B) no idea how to star-rate it, (C) no idea what I’m doing, and (D) NO IDEAAAAAAA. So I’ll read some other reviews and totally befuddle my own opinion, and then I’ll look for the perfect gifs because #priorities. Oh and I’ll make a brownie. Or nine brownies. And then I’ll discover the life on Neptune and create my own language and find all my missing left socks. AND AFTER ALL THAT I MIGHT WRITE THE REVIEW. Might. Average Logic: I could get rid of it since it bothered me so much? Donate it, give it away, sell it? Bookworm Logic: But what if I put it on shelf next to some EXCELLENT books so it learned, by direction and guidance and osmosis, how to be a better book? And if that fails I’m going to stack 92 books on top of it as punishment so it feels FOREVER SQUASHED just like my delicate temperament when it let me down. Or maybe I’ll wear it as a hat. OR MAYBE I’LL EAT IT. Or maybe I shall rename it Harold and use it as a mop. Is there a chance Bookworm Logic will improve over time? No, no there is not. In fact, the deeper you get into the bookworm life, the more incomprehensible bookworm logic you adopt and live by. NO NEED TO FRET THOUGH. We’re not alone. We’re in this together. 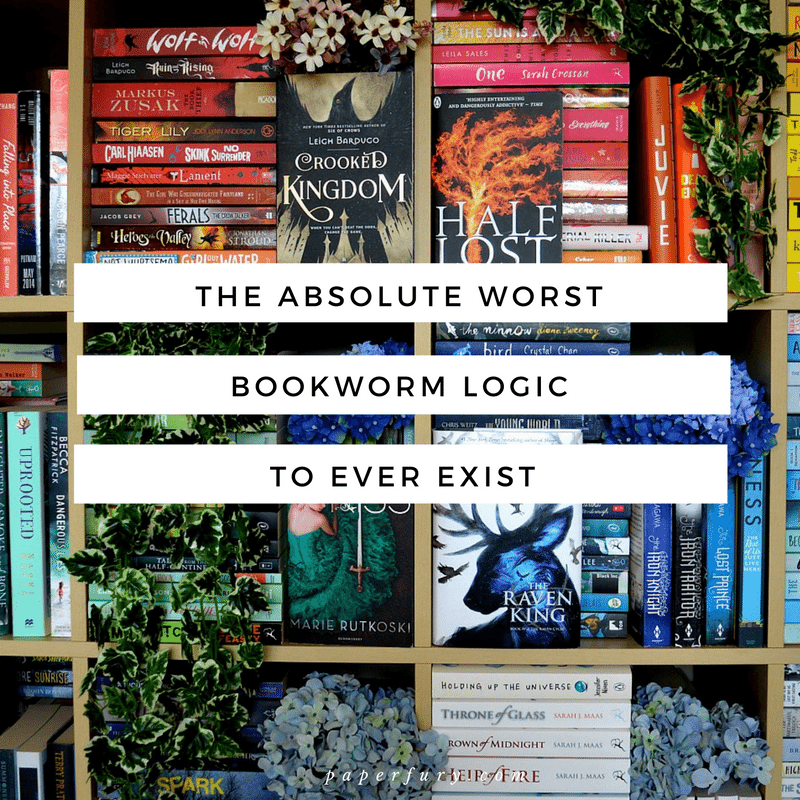 i definitely want to hear some of YOUR brilliant worst Bookworm Logic!?? add to my list! did you relate to any of my translations??? is the gif for #10 not the best thing ever?? do you solve your TBR problems by…adding to the problem? SHARE WITH ME ALL THE THINGS, FIENDS! Let’s buy the entire trilogy even if I have no clue what the book is about, never tried the author or the story type but I can’t risk the edition to change and then I’ll get a mismatched set. YES THIS MAKES PERFECT SENSE FOR WE BOOKWORMS.😂 And like boxsets are worth it just to get them matching, right?! Ahh if I had a dollar for the amount of times my family has looked at me like I’m a psychopath after I’ve shown my bookworm logic….I’d be a millionaire and could probably BUY A WHOLE BOOKSHOP WITH ALL THE HARDCOVERS EVER! This is the most logical post ever. What is this ‘average person logic’?! I DON’T SEE WHY IT SHOULD BE BOOKWORM LOGIC WHEN IT IS THE ONLY UNDERSTANDABLE LOGIC. I spend allllll my money on books AND I WILL BUILD A HOUSE OUT OF MY TBR. What is this e-book you speak of? Hardcovers WITH PRETTY COVERS because bookstagram, and only even if I hate them I gotta keep em BECAUSE PRETTY COVERS LOLOLOL. Also the amount of times I’ve butchered fantasy names and then I hear the author say it properly and I’m like “nope, that sounds wrong”. Hard reviews? Please. JUST PUT ALL THE FLAILING AND ASLKJFLASDJOWIQRYEWHSD. Ok I’m done. This post is pure koala tea. And it’s like once we’ve got that mispronounced name stuck in our head…THERE’S NO GOING BACK.😂 THERE IS NO FIXING THIS MESS. Am I the only one who thinks Cait should have her own magazine, maybe called The Bookworm Times..or something awesome like that. I can relate to this blog post more than any magazine article I ever read! Ex. “Does he like you?”. Who cares, I have books! Average Logic: Eh. Guess I’ll use a different GIF/not use a GIF at all. Bookworm logic: Well there’s a post that isn’t getting written. Average logic just sounds boring tbh. I mean, I’ve bought SO many books because of covers (Thanks, Bookstagram). And I’m a big fan of sacrificing people at dawn if they don’t like my favourite books. It’s such a DISAPPOINTMENT. Everyone knows the bookworm life is the BETTER kind of life. #legit And I blame bookstagram for all my problems these days. IT’S GREAT. I’m also a fan of: (A) Let us just put the books everywhere. On the windowsills and on the floor and on all the cupboards and in the middle of the room floating at eye-level, because pfft! who needs open spaces? What am I? A gazelle? That IS just good sound engineering logic. It even sounds more sensible than my “I need more books otherwise the books I have will get lonely” logic so you’re winning here. And while I love to smell my paper books, and admire them on my shelves, I prefer to read e-books. That way, my paper books stay perfect!! BOOKWORMS. Oh, they’re the worst. Good thing I’m not… *whispers* don’t tell the world I’m a bookworm. I like to live in my house not insane asylums *yells* NOTHING TO SEE HERE MOVE ALONG MOVE ALONG NOW PLEASE. <– Ok what did I just say it makes no sense. ANYWAY. Yes, bookworm logic is so bad. What about 'I'll do the dishes/make my bed/exercise/feed the cat/dog/small dependent child… once I finish my chapter?' Then 7 chapters laters 'why is everybody trying to make me do stuff don't they understand I was reading?'. #actuallogicrightthere. *pats shoulder* It’s okay. Making no sense is a side-effect of reading my blog. WE’RE ALL MAD HERE AND YOU’RE AROUND GOOD FRIENDS. *gives you insane cupcakes* Also bookworms are the worst. Sheesh. Just terrible. And like this whole “finish a chapter” thing is a bit silly. We want to finish THE WHOLE BOOK. It’s not like we ask for much at all. We only ask for tiny things. Well I have to admit that I don’t do very many of these… but bookworms are clearly irrepressible, and it makes sense. Whatever. I really read books subject to their availability…so I guess I’m sort oa sensible bookworm….except the crying in public part, that happens all the time. Or worse, laughing in public. But I’ve reached the point where I don’t care. I guess my bookworm logic is that I need to bring a book everywhere I go, even if it’s like a party and I won’t have time to read. Or two books. Or three. Laughing in public can be a problem too.😂 Or like if you’re listening to an audiobook and you forgot not the whole world is enjoying the hilarity and you end up snort/giggling while you’re out and about??? Oh, oh just me? OKAY THEN.😂 And yES bringing a book everywhere even if you won’t necessarily get a chance to read it is definitely bookworm logic. So very true, Cait. I especially relate to your points about tbr and crying in public. Also mangling characters’ names is the story of my life. Being a foreigner and all.. I think fantasy authors sit in their evil writing dens and LAUGH GLEEFULLY AND MANICALLY at the suffering of we poor bookworms trying to pronounce their impossible names.😂 They’re terrible! As for my “Bookworm logic” . . . What about “I don’t really read this book anymore. I should get rid of it. Except what if I have kids someday? And I want THEM to read it? What kind of parent would I be if I didn’t pass down the magic of my youth-loved books to my children? A HORRIBLE ONE, that’s what kind!” Thus why I have about half a bookshelf filled with books I mostly never read. OH YOU POOR MUGGLE.😂 Hehe, just kidding!! That’s okay, I didn’t think all bookworms would relate. Just the psycho ones like me. ahem. I want to read all the books on my Goodreads TBR but it’s literally in the thousands now and I have this teeny tiny problem where I add like 10 for every 1 I read. I’m not sure how that happened but it did. Some of us have yet to succumb to the acceptance that our bookworm behavior will now alter our former life beyond recognition. Get with it already, people. We must make sure there is no dust/fuzz/cat hair on a page before we turn it. No one is allowed to interrupt us before the end of a chapter (even if the house is burning down/there is a rabid fox in the driveway/someone is calling to offer us a job). The world is not permitted to explode before that new release we’ve been coveting is released and we’ve had a chance to read it and react in the feels. Oh, Cait, your timing is impeccable. I listened to the entirety of The Serpent King today and ran into the problems of (3), (8), And (9) and it is 100% your fault because you recommended the book to me. Do not think I didn’t add you to the naughty list. Every single thing on this list is SO TRUE. Especially number 4 because I will force a book on my friends, whether they want to read it or not, until they read it. I am such a great friend!🙂 And I have bought so many books based on looks alone. It’s not even funny. Oh no, lamb kabobs!! I grew up eating the deer & rabbit & squirrel my Grandpa hunted, and the fish he caught, but I’ve yet to eat lamb or duck. I like those animals too much! Lamb b/c I grew up reading James Herriott (and there are a lot of scenes of him helping to birth lambs out in the bitter cold), and ducks b/c we used to feed them all the time at a local park. Oh, and speaking of cake! I’m making a White Texas Sheet Cake for Christmas this year. Nothing fancy in terms of ingredients, but SO GOOD!!! CAIT. Please write Armageddon and Back Again. Please. I will somehow ship cupcakes (or at least pics of them). And this post is totally and completely accurate. I read this on lunch at work and was totally dying laughing because it is one hundred percent true of all librarians as well. But I book logic is the better logic. Give me books! I totally cracked up at #4. Great post, Cait. Have a wonderful holiday!!! I love ALL OF THESE. You know those things that are so funny BECAUSE THEY ARE SO TRUE??? …yeah. WHO REALLY NEEDS TO EAT ANYWAYS?? Besides, living off of brownies because those are the only ingredients left in your house is FUN. In my first finished book I had to force myself not to write about food BUT I COULDN’T HELP IT. I kept writing when I was hungry and there was nothing to be done about it. I WOULDN’T HAVE IT ANY OTHER WAY. These are all so true! I’d have to say my #1 instance of bookworm logic is when I buy a ton of books because they’re on sale. I tell myself that I’m saving money – but I would have saved more money if they weren’t on sale in the first place and I didn’t buy any! I think the worst was when I promised myself that I was only going to get ONE BOOK but then there was a sale AND I had coupons and I think I ended up with six. *sigh* maybe someday I’ll learn. Bahahah, I RELATE SO MUCH.😂 Like the other day I had to use up some book vouchers and either I could be $8 under or $20 over and I was like…”obviously I can’t waste that $8 so I’ll be thrifty and spend more”.😂 I DON’T EVEN KNOW WHAT TO DO WITH MYSELF HONESTLY. That Legolas Gif though, haha. So true on the names though. I mangle all of them all of the time. The fact that I can relate to most of these and didn’t even realize there was such a thing as “bookworm logic” is hilarious to me! The character name one is SO TRUE! I never google translate them until after to see how badly I messed up the name but even after knowing the correct pronunciation I will still forever say it the way I thought it was in my head while reading. Another fabulously hilarious (and true) post, Cait! Normal Person: I have an 8 a.m. class tomorrow, so I should just read a few chapters and go to bed early. Crazy enough, many of these thoughts have swarmed through my brain from time to time. You are not alone! BOOKWORM LOGIC IS COMPLETELY SOUND. Anyone who disagrees can fight me, years of reading frustrations compacted into 5 foot tall rage. Fear me. Though yes, this was quite accurate. SALADS ARE DANGEROUS THOUGH, UMA. I MEAN, ALL THOSE VEGETABLES OMG. RUN WHILE YOU CAN. Average logic: I am going to DNF this series because really, who can spare another precious 78 years off my immortal life to wallow in the terrifying awfulness of the book & series??? Bookworm Logic: OF COURSE I’m going to read the last one, why stop now, O faint of heart? WE MUST KNOW HOW IT ENDS. Life will have no meaning if we don’t. IN FOR A PENNY IN FOR A POUND [phrase developed and pattented by disappointed bookworms reading series]. Bookworm Logic: WHO REALLY CARES ABOUT SOCIAL LIFE TBH?! I have this REALLY GOOD BOOK (well I don’t know yet if it’s any good but so what it’s a book and that’s what matters) that I just got and NEED TO READ ALREADY and true friends will understand and if they don’t they can get a life probs. BOOKS > socializing. And books > social life. Every time. AGh, yes those 500+ page books can be little hand killers. *weeps whilst trying to read Game of Thrones* 😂 But yes, fuel yourself on cake. It’s obviously the answer here. Hey! I’m Arunima. This post was hilarious, I can relate. I’ve been reading your blog for a while now and I love it. I’m a bookworm too. I absolutely LOVE reading and writing stories. #4 absolutely definitely calls for a sacrifice at dawn. Nothing else to it. OF COURSE. I mean, there’s no other reaction. Bookworm logic: buying and collecting all kinds of strange objects that might look good in a bookstagram one day, maybe. The TBR crushing is real but I don’t have the money for it so #libraries But then again, I return two and borrow five more. WHAT SENSE DOES THAT MAKE?! There’s also fun things like buying books you’ve already read because they have new cover art… Or being absolutely bone tired and still insisting on reading because OBVIOUSLY! Or taking your book with you EVERYWHERE just in case you get an opportunity to read buuuut you only ever get to read when you go to bed. But again, NOTHING IS WRONG WITH THIS. Love your post as usual Cait! Always entertaining! YOU ARE SO RIGHT THOUGH. Actually our logic makes sense and everyone else is weird. #obviously 😂 And yesss, sometimes I buy books just because they’re pretty or I’ve already read…and I have basically zero regrets. I think we bookworms are all clones! This is so me! HAHAHA! Hah! This post made me laugh and smile:) My favorite is #4. Instead of a person not liking my favorite book, I say aloud what a normal person would say, but my inner thoughts are that of a bookworm. I should feed my TBR more often. I don’t do it enough. I have a mental TBR in my head, but one that is not as updated on Goodreads. Ah, well. I know what I want to read, when I want to read. Right now I’m reading Replica by Lauren Oliver. I live the way it was made, and how I can flip back and forth. The story is alright, but I’m more in love with the aesthetic. Ohh, let me know how you go with all of Replica?! I had it out from the library but it was like A MILLION PAGES and I wimped out and sent it back because most of the reviews I’ve seen are 2 or 3 stars.🙈🙊 But I’m still intrigued! Yes. All of that. And then you have kids… So of course you have to get all the books that you no longer have that you used to love. And picture books. All the picture books, because they are beautiful. And then the demon spawn that think they are your children DON”T LIKE YOUR BOOKS!!! But you keep them anyway because maybe their younger spawn sibling will. Or a nephew, or small visiting child…. Oooh, collecting children’s books is wonderful too!! I do for my nephew/nieces. WE MUST CONVERT ALL THE LITTLE CREATURES TO BOOKS TOO!! HAHAHAHA this logic is the BEST! Especially #1, 2, 6, and 7. Poor bookish characters will just have to live answering to the mangled version of their name that I call them (or any nicknames that I give them instead). I spent one whole book calling one character the wrong name and didn’t realize it until I went to write the review. Quesnel = Quenton in my head. Autocorrect of the brain. >,< lol! Sometimes I don’t even TRY pronouncing their names so they’re just like “BLANK” in my mind and it’s a disaster if I try to talk about the book out loud.😂 And I totally rename them too!! Bahaha to “autocorrect of the brain”. YES AND RELATABLE. 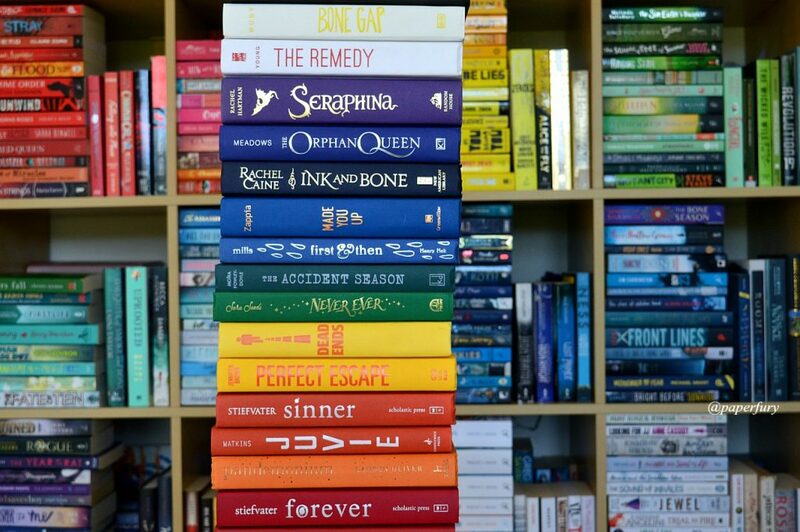 We are definitely smart *nods* *pretends is not buried under 3989 books right now because cannot say no to them* And we neeeeed phsyical books with pretty covers because BOOKSTAGRAM!! Beautiful. And true, every word. To convience people that bookworm logic is absolutely normal, I always bring the example of shoes. A friend of mine has this enormous amount of shoes (clichè women and shoes…). Everytime she wonders why I need so many books, that I haven’t even read, I ask her: “Why do you need all these shoes, that you don’t even wear?”. Silences her everytime. See, we are not weird, the other people are! Beause, why would you spent all your money on (stupid) shoes, if instead you could buy books?! I like the sacrificing part. How can anyone not like your favorite books?! It’s treason. We bookworms can never be satisfied.😭😂 It is our CURSE. hehe. Hahah this reminds of the times where I’m like “friends you have to read this book it’s really good”, “is it sad?” “no” *gives them The Book Thief* I always lie about these things because I WANT them to finish it. And they won’t finish it if it’s sad so I gotta lie. It’s in my nature. And for that pronunciation thing. Yep. I was listening to Seraphina via audiobook, and it was very hard to follow because all these names are popping up and I could not keep track of them at all. I rather read it and have my own pronunciation in my head. Also when I went to read Shadow Scale, I was even more messed up because I didn’t know what matched on to which label. Yes yes lie always. I always lie to my sister and then watch her descend into terror. Although she wasn’t going to read Holding Up the Unvierse until I promised her it wasn’t as bad as All The Bright Places.😂 AHEM. But c’mon. People say they don’t want sad books, but they really do. We know it deep down inside. And sometimes like I make the pronunciations simpler?!? Like if the dude’s name has a million Ys or I’s or something, I just shorten it in my head and it makes a lot more sense. Daenerys, for instance, is never Daenerys.😂 Let’s go with Dani and stop there. I thought I was a bookworm (and by worm we all mean dragon), but it seems I’m just an average person. At least as far as logic goes. I still read a lot though. My one regular instance of bookdragon logic is with time. I can manage money, but I will read half the day away sometimes. YOU MUGGLE!! 😂 Haha, just kidding. But hey I did put that disclaimer at the top that said it might not be all bookworms.😂 It miiiiight be just me. Ahem. IT IS TOTALLY GUARANTEED TO WORK I’M SURE OF IT. *nods* I’m in the current process of duct taping my sister to a chair to force her to read The Raven Boys, aka my favourite books of ever. I’m sure this will go down fine and won’t backfire at all. LOOL I missed your blog posts.. they’re so hilarious as always. I agree with the how to tackle a bad book haha I do that all the time. Thank you for sharing & love the pretty bookish pictures! Best. Logic. Ever. Just saying. AND JUST YESTERDAY I MADE THAT TWEET ABOUT QUEEN FURY. OKAY SO ACTUALLY I HAD THIS POST SCHEDULED BEFORE YOUR TWEET. BUT. THIS PROVES WE’RE BRAIN TWINS. Why must all your posts crack me up and urge me to pet my books all day as opposed to the 12 hours a day? I must say, average people are missing out! They need books and they need them NOW. Then of course, there are the pretty books! What are these ugly books you speak of? The pretty ones are most boot-I-ful on the shelf! As Always, although I am a newer reader, your posts are my favorites and quite worth a read when I’m not tackling my tbr pile! I’M VERY GLAD THIS MAKES YOU LAUGH.😂 My work here is done. *flings confetti over both of us* But YES average people are missing out!! Like they must live such boring lives with this sensibly boring logic they have?? Sheesh. Oh, Cait. Never stop blogging, okay, dear??? I would shrivel up and die without your hilariousness. JUST FOR YOU, I SHALL NEVER STOP BLOGGING. A +, though. A freaking plus. My Goodreads TBR is long enough for the next 15 years, but I’m always looking for new books to add to it. So relatable.😂 That is me ALL THE TIME TOO. At least 8 of your resume 10 points are 100% me. I’d honestly have ALL books in hardcover if I could! !😂 But like, I definitely can’t haha, so I do like a few paperbacks. I actually like paperbacks with loose binding because they’re easy on the wrists to hold open! “But it’s pretty and it’ll be beautiful on my bookstagram account so I’ll just buy it and regret my life later.” HAHA, I am so guilty of this. My brain says, “Just wait and get in from the library,” but my heart says, “MUST POSSESS THE BEAUTIFUL THING.” This whole list is great!